This page tells you all about PayPal Pro: To use PayPal Pro you will need to have a PayPal account with PayPal Pro acitvated. 1. Sign up for a PayPal Pro account. To connect your Website to the PayPal Pro payment gateway, you must first collect your PayPal AP signature information, and then enter the three values in your website Payment Processor. 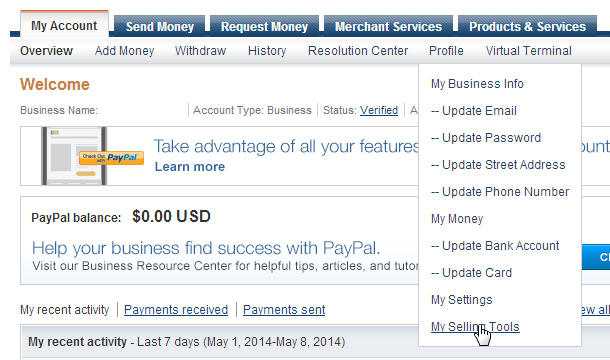 Log into your PayPal account and navigate to "My Selling Tools"
Then click on Option 2 "View API Signature". This will display the API Username, API Password and Signature. These 3 values you will need for the next step. After you havegathered your API signature values, you will need to setup the Payment Processor on your STN website. To do this, Login to your website Administration (back-end), and go to the Shopping Cart >> Store >> List Payment Methods. Here you will see the list of Payment Processors (also called Payment Method Types). You are going to need to add a new one. Click on the "New" button on the top right. This will load a form page that you will need to populate. Give it a name like "Credit Card". This is what the shopper will see. The Code field is to let you recognize what the payment processor that was used. We rcommend using "PPP". On the "Payment method type" you will want to select "Credit Card"
PayPal Pro accepts Visa, MasterCard, American Express and Discover Card. But prior to accepting American Express you must agree to the American Express terms on the PayPal site. So select Visa, MasterCard and Discover Card plus if you have agreed to the American Express terms then select them as well. Next hit the "Save" at the top right. From the list look for the Payment Method with the Code "PPP", then click on the red name "Credit Card" name to open it. This will display the options for the PayPal Pro payment process that we just filled in, but now we need to add the API signature values so that your website can communicate with PayPal. To do this click on the Configuration tab. You will see the fields that match the API sugnature information provide by PayPal. Populate the fields with appropriate values and make sure you are in "live" mode. 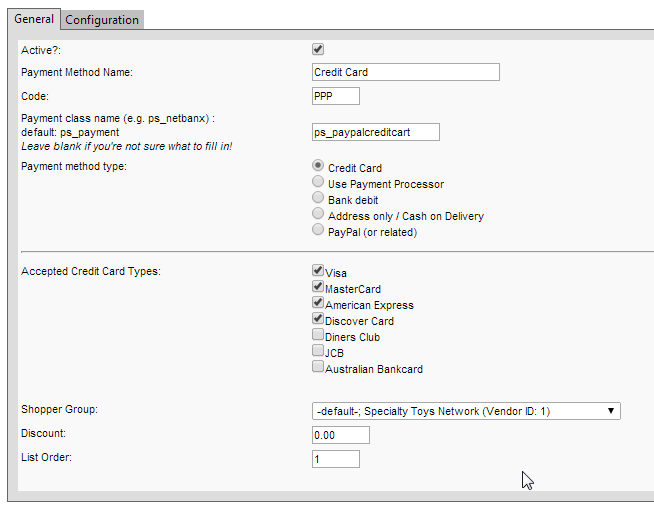 The Shopper Group option allows you to make this payment processor available only to a specific shopping group. By default it is assigned to the default shopper group. This would be changed only if you wanted to offer a specific shopper group this payment option. The Discount field is where you would set a discount that would be applied during checkout at the time of payment. The List Order is for the arrangement of multiple payment options. For example; if you are offering 2 different payment options and you wanted this payment option to be 1st in the list, you would enter "1" in this field and put a number greater than 1 in the other active payment processor(s). Save and Check Activation States. Of course, Click the 'Save' button after making your changes - and be sure that this payment processor is set to "Active" and any other payment processors that you do not want to use are set to "Not Active" (Unpublished).